This is from MP, posted by Ozzy. 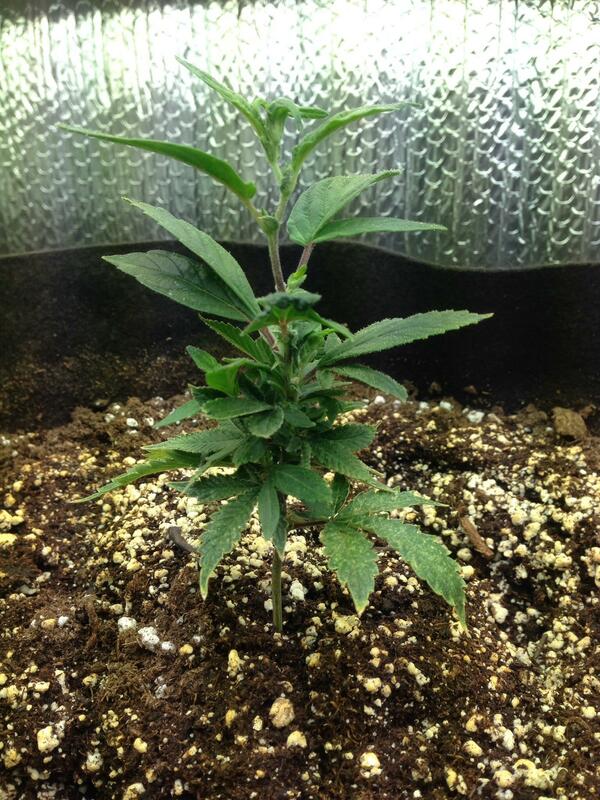 Cut a long-stemmed clone from your mother plant. take a whole lower branch-these are chronlogically the oldest and will root the fastest. 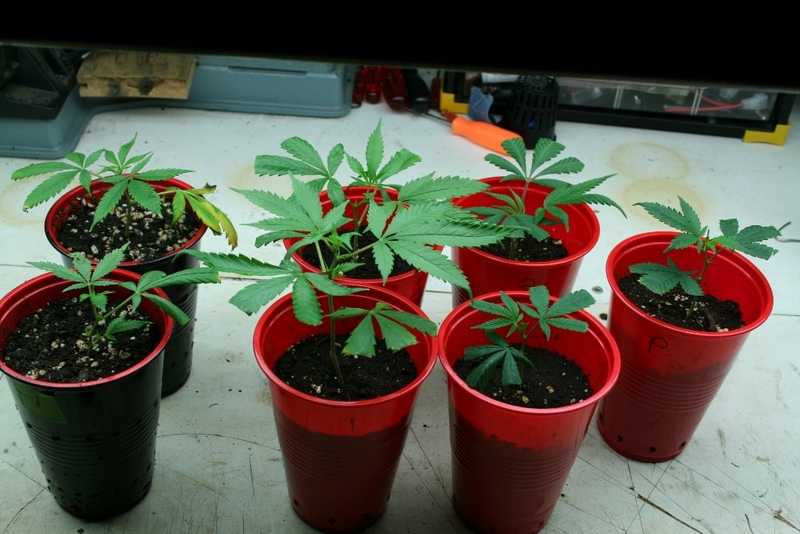 trim off all the lowerbranches on a steam at least 6 inches long but preferably 9 inches or longer.As long as you have a growing top and two fan leaves the clone will prosper. 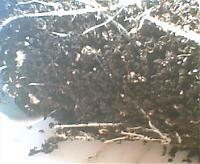 Use a pencil to make a hole in the soil to insert the cutting after you have dipped it in rooting hormone. Simply water it with 4 oz of 1/2 strength vegetative ferts water each cup evenly and then place it a few inches beneath a fluorescent light. In a week or two the cutting(clone) will have started to root. 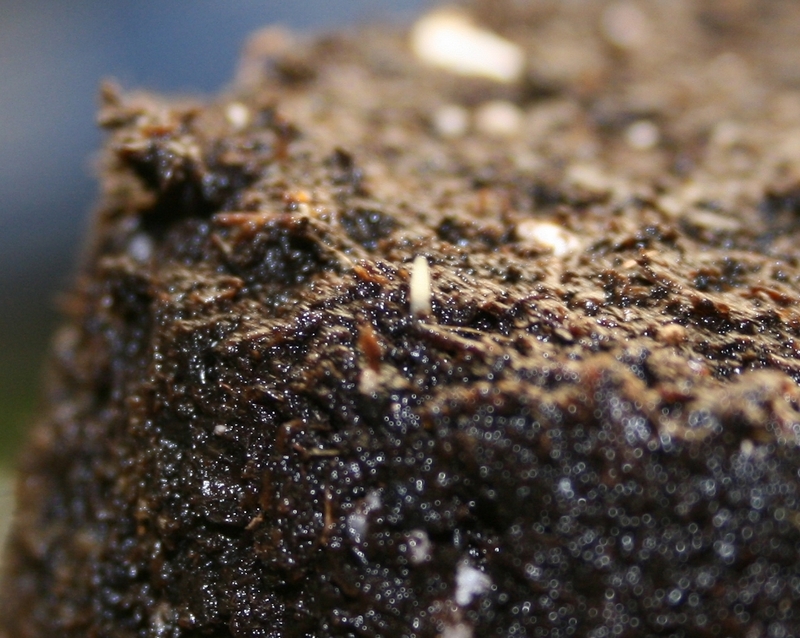 Fertilize the plants lightly, when theystart to grow bigger, you can give them a full strength fertilization before transplanting. If you cut or drill holes you can water from the bottom for even better root growth. 15 days ago I took these 4 cutting to just try this way all 4 rooted That does make it a easy way to clone just make sure the soil stays moist. Ozzy , I am trying out this method for cloning, do I have to use 1/2 strength veg ferts or will plain water work? I just want to double check. I am using MG seed starter . plan water works the best til you see roots. 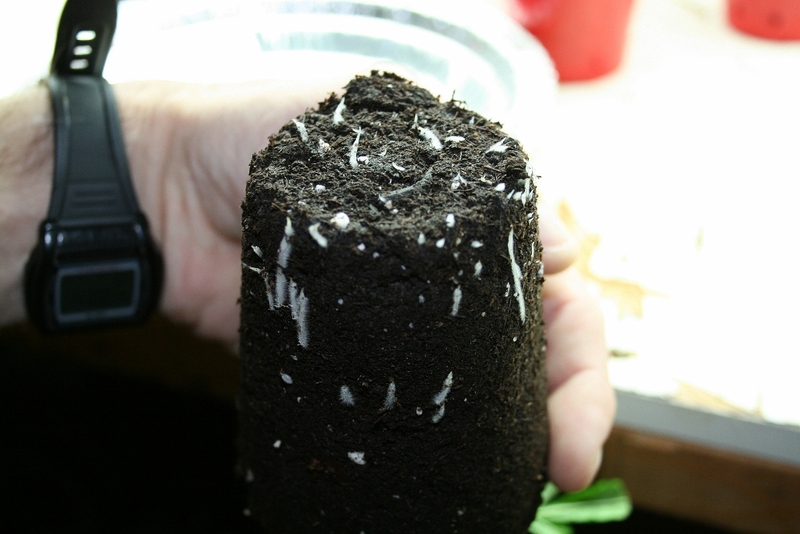 just keep the soil moist and the roots will show in 10 days most the time I have saw them in 4 days but most the time 10 to 4 days is window. Cannabis grown with care grows into medicine somewhere! Thanks Ozzy , I will use plain water. This should elliminate the transplanting into dirt step since they are already in dirt. Surf, I think this one will be good for me because I am in dirt and I think it might save a little time not having to worry about recovery time from transplanting. 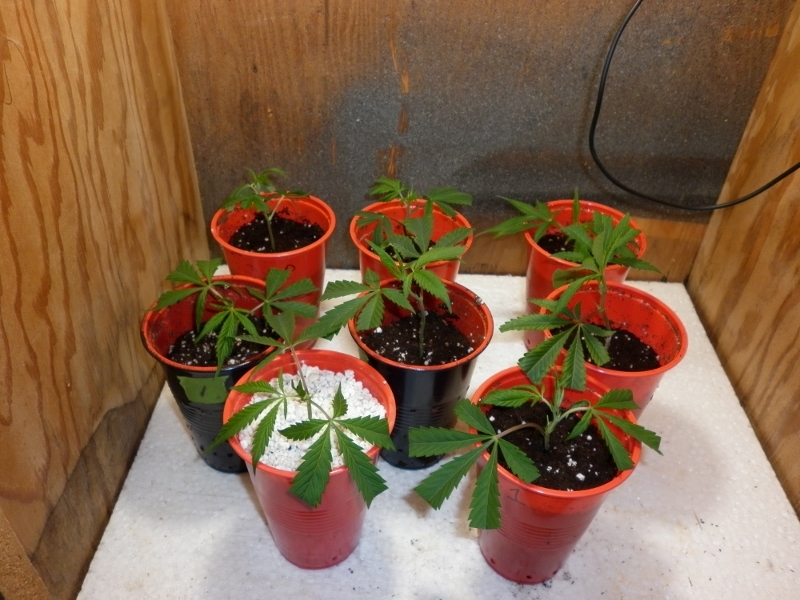 Fit 5-8 in a med zip freezer bag n row em pretty tight in a seedling tray. ;). With Ozz on the plain water. I came across this on icmag n since running gh3 I have tried n do use this in the bucket for cloning. Recovery time n xplanting. Lol why ?? But find them to explode more then anything after an xplant. Just a curious question I guess. Lefthand, I don't normally have problems with transplant shock, this just eliminates one step, from the cups they go into the 1 gallon Geo pots I am trying out. 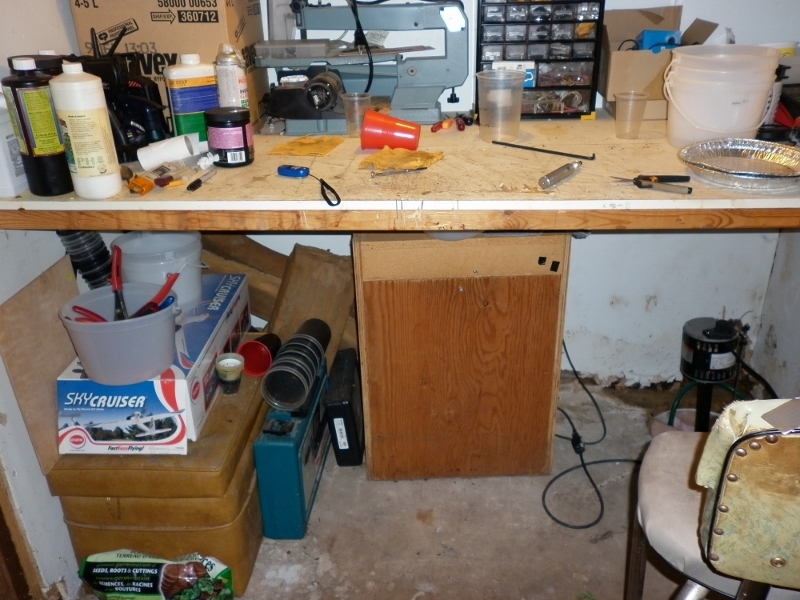 I have done the zip lock bag, rock wool, rapid rooters, have a bubbler going right now, they all worked. Is the Clorox for disinfecting? Ohhh nice. My hydro store just ordered some in for me to test out. Do beleive they were geo pots. Yes I beleive so on the Clorox. It's such a small amount that I just start with water from the tap. I never did have luck with the bubble cloner one good run then hit n miss so went to zip lock bags. Me n rw don't mix. Lol not for cloning any how. 4 days, so far I have not misted them, no dome, that is one less thing I have to remember. I have a root, this is 7 days. I am sure the roots started earlier though. So far so good. It is showing on one of the Satori. 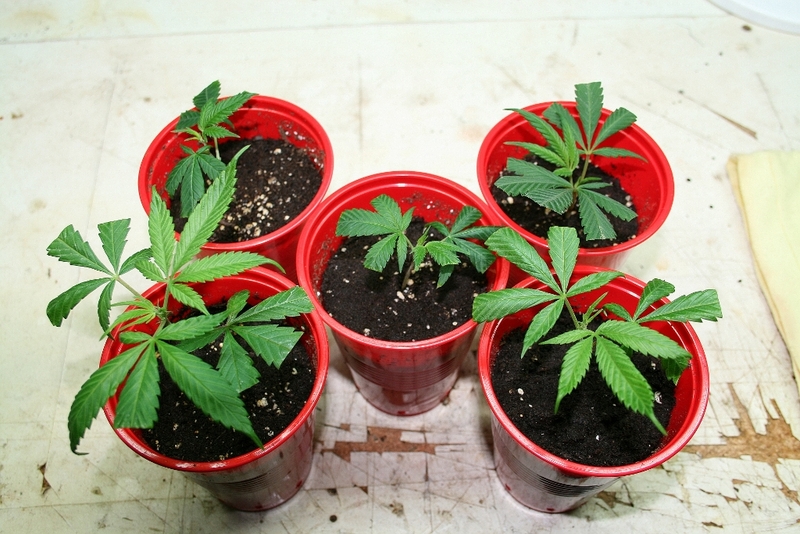 14 days, they all have roots similar to one pictured, the 2 on the left are out of the bubble cloner, they still need some time to show roots through the dirt. Conclusion , out of all the cloning methods I have used this one saves me time plus a 100% success rate this time around. The last round all made it and are now flowering. Using the same method again except I have one with perlite instead of MG seed starter mix. If it works it might be a good technique for hydro growers. They will stay uncovered. See if I get roots in 7 days like last time. 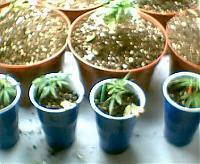 Had bad luck with this round of clones ,none rooted. I can only say it was probably from using my dehumidifier water, that is the only thing I did different . I learnt my lesson, popping seeds I guess. well, this is just simple as can be. AND it works!!! To hell with the dome and tray. This method worked faster and you don't need a separate light for it. 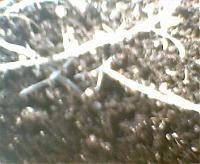 I just set them below my already veg'ing plants and about 5 days later, i can see stabalization and roots starting. 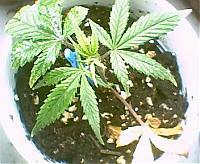 I saved my UOG by cutting a clone off of a flowering plant. It has taken root and is in veg now. As you can see in the pic, the nodes were stacking really nicely. Do I need to cut all of that off now or just let it grow out and lollipop it later? Gooey's simple minded way to grow.